<>The "In'possible puzzle delux version"
Tray & lid and Pieces :mahogany,chakte viga,Ebony,Maple,zebrano..
As promised.i made the same puzzle but with a lid (boxed).The lid is a place that you pack the pieces again so it closes nicely rather than having only the tray with the pieces random inside. The window in the middle forces the pieces when placed in the lid a nice solution. 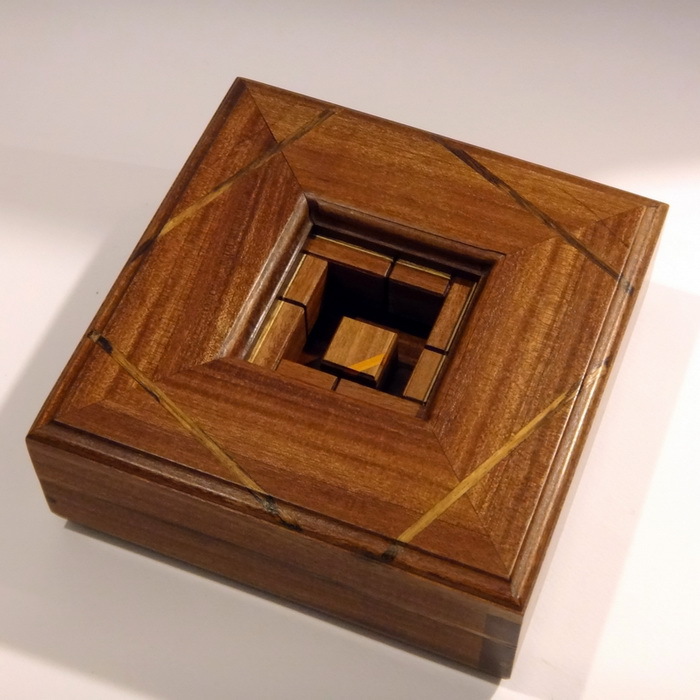 If you enjoyed playing with it at the International puzzle design competition 2013 (IPP33 japan)then this is more fun and also i am happy how it turned out. The ofset inlay splines give a little character. See more pics of the "inpossible" puzzle.or Back to puzzle index.